LG announced at the Digital Signage Expo today a new narrow-bezel video wall solution with a combined 1.2mm bezel to bezel width. The ultra narrow bezel display is on view at LG’s booth at DSE at the Las Vegas Convention Center this week. Smith also explained how, at 1.2mm bezel, for a video wall in a corporate environment, the lines of the bezel are not really bigger than the lines in an Excel spreadsheet. 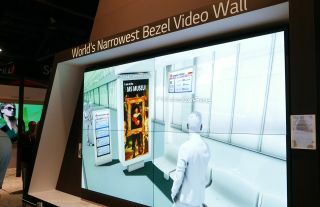 The video wall display is also equipped with LG’s webOS 3.0+ Smart Signage platform, which uses the display’s system-on-a-chip (SoC) to deliver a variety of content options and web-based applications across multiple platforms, providing end users across a host of industries convenience and ease of use. Featuring Full HD (1920 x 1080) resolution and an eye-catching design, the new 700-nit video wall solution is perfect for the display of advertising and wayfinding information in retail, corporate, government and transportation installation environments. The LG SVH7E video wall display joins LG’s portfolio other narrow bezel and ultra-bright video wall displays redefining the video wall category. The 49-inch model 49VM5C, 55-inch model 55VH7B and 55-inch model 55VM5B video wall displays all feature a narrow bezel to bezel width of 1.8mm allowing them to be easily connected. LG also offers a 55-inch ultra-bright video wall display (model 55VX1D), which offers users an innovative solution that is 1,500 nits—three times brighter than conventional video wall displays—in a 3.5 mm bezel-to-bezel width design. Each model in LG’s video wall portfolio is lightweight and designed for seamless installation and simple maintenance. Visitors to LG’s booth at DSE 2018 in Las Vegas (March 28-29), Las Vegas Convention Center, Central Hall #1911) will be able to experience the new LG SVH7E ultra-narrow video wall display along with highly-acclaimed products from the industry’s broadest portfolio of commercial displays. For more information, please visit www.lgsolutions.com.